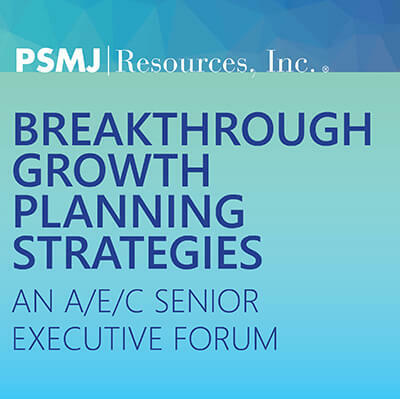 Led by PSMJ Founder and CEO Frank A. Stasiowski, FAIA, this Forum is exclusively for A/E/C firm leaders who want to develop a new and customized growth plan they can put into action the first day back in the office, with clearly defined steps addressing strategy, marketing, finance, project delivery, HR, and ownership transition. But, you won’t just be hitting those nails with the same old hammer. In this completely confidential and candid setting, Frank turns traditional thinking on its ear. Everyone wants to improve branch office performance. But, unfortunately, too many firm leaders make the same mistakes and end up with disappointing or suboptimal results. This interactive and engaging program is your chance to get the proven branch office optimization strategies and tactics to steer clear of common (and not-so-common) branch office mistakes. Expect plenty of case studies and data to get you positioned for success on matters such as "cold starts" versus "warm starts", establishing clear reporting and financial management practices, making the best use of marketing resources, and much more. It is never too early to make plans for your firm's long-term survival after your departure. A/E/C firm owners who fail to plan properly on ownership transition are leaving the firm exposed to the potential for undesirable outcomes - including significant loss of firm value, brand equity deterioration, and loss of market position. Instead of being another ordinary seminar teaching you how to develop a plan, this insightful and data-rich program also takes you through virtually every transition planning obstacle you will encounter (from affordability to leadership development and more) and how to overcome it. In mergers and acquisitions (whether you are buying or selling), it is easy to make a million-dollar mistake. Ever wish there were a place where you could get the latest insight on how deals are coming together, hear war stories of what to watch out for, and get the tools and tips you need for M&A success? This is it! Way more than just a seminar, we've designed every ounce of this program to ensure that we give you an equal mix of learning and doing. With plenty of case studies, exercises, and real examples of valuation and deal structures on real M&A deals, you'll see why this program always fills up quickly!